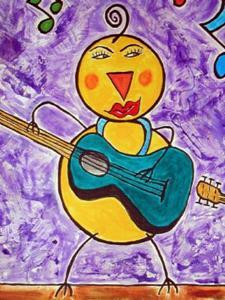 Here's some adorable (Rock-n-Roll) Chicks with Guitars! 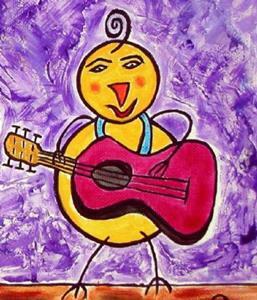 I painted this whimsical piece for the EBSQ "Chicken" show, since I'm such a big music fan, I thought I'd do a music-related tongue-in-chick (oops, I mean cheek!) piece! Also, I've been lucky enough to be contacted by a printing company to make "promotional cards" out of this piece. 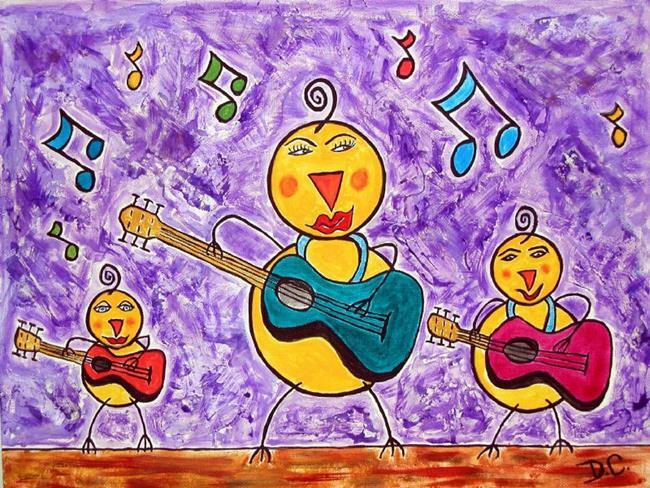 It depicts three "chicks" of varying sizes performing onstage with the largest one in the middle, each one strumming a guitar while various colorful musical notes wafting through the air around them...one can only imagine the type of music they're playing. Each chick has a different expression on her face. The largest one in the center has luscious red lips, and they all have a single, thin black wispy curl on top of their heads for hair. For several years they were the opening act for "Three Dog Night"!! Some of the colors I used are: purple for the textured background, and burnt sienna for the ground, deep yellow for the chicks themselves, orange for their "beaks" or noses; and pthalo green for the large guitar in the center and fushia for the 2nd largest (on the right) and red for the smallest guitar on the left. The musical notes are various colors of blue, green, yellow and red. This piece would be great for any aspiring female rock star, or just a chicken lover!! 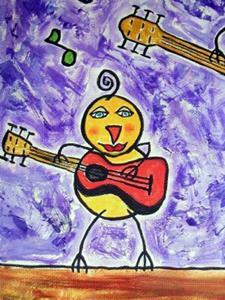 Very happy, bright and fun piece!